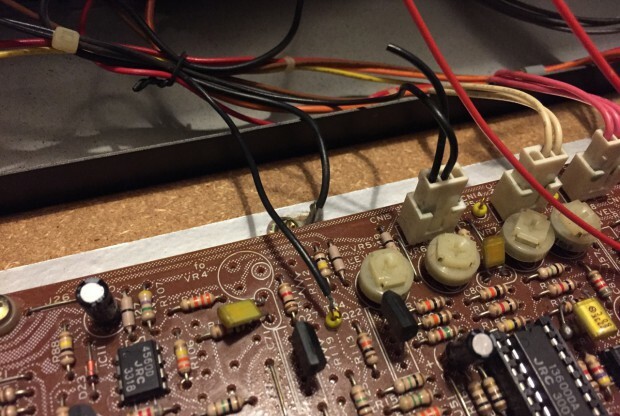 I love my Korg Polysix, but there’s one thing always bugged me about it. There’s an awful lot of static background noise that is constantly sounding, regardless of how the filter is set or if an effect is used. I have also found the sound a bit muffled. The other day I had the opportunity to troubleshoot the signal path with Nils to find out where the noise came in. The Polysix has been equipped with a generous amount of test points and it turned out it was quite easy to narrow it down. The noise is added in the effects board KLM-368A. This board contains tons of aged components that does all sorts of processing to create the chorus, phase and ensemble effects. The effects in these kinds of synths are neat, but quite frankly they are rarely any good. Analog synthesis is amazing and hard to replicate digitally, but effects are better done in post-processing in a computer in my opinion. So I made the decision to simply bypass the effect board all together. It turned out this was extremely simple. 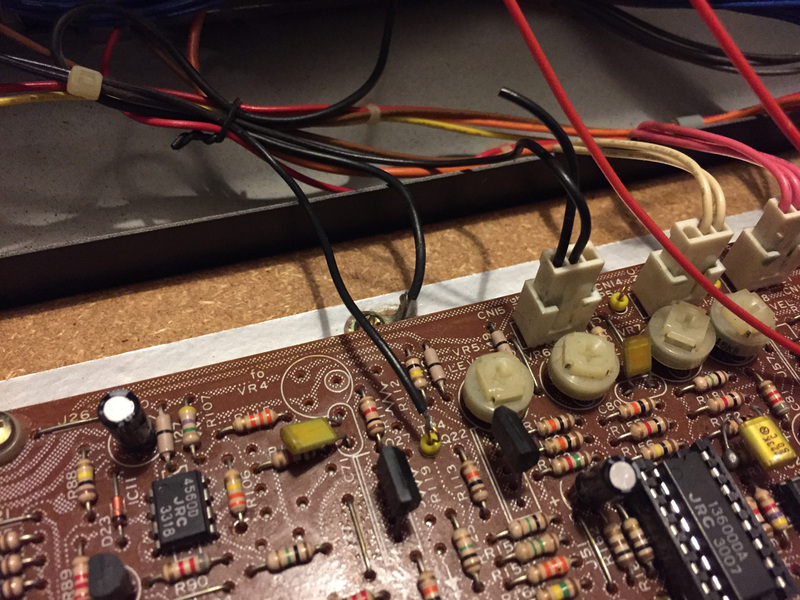 The only work needed was to snip the signal cable going from the effect board to the output board, and instead solder it to test point 4 which is the signal coming in to the effect board. The result was amazing, a noise free, non-muffled, clear sound. There are of course more sophisticated ways of doing this mod if you want to continue to be able to access the effects, for example to add a switch. But if you just want a noise free clean sound it’s this simple.